Cuddlist® brand professional cuddling is a relatively new and growing international service where a practitioner and client agree to meet for a session, and practice a consent based non-sexual exploration of trust based healthy touch. In this session, each participant agrees to be bound by a code of conduct, and to the simple concept of letting the other person know that if for any reason they feel uncomfortable, they will speak up. There are many forms of self-care activities that serve us well as individuals. Exercise, walks in nature, yoga, meditation, professional counseling, and self-reflection are all great examples of thing we can do to be more in touch with ourselves and have personal growth. Professional cuddling comes into play when someone realizes that their need for safe and platonic human interaction is not being met in their current life circumstances. 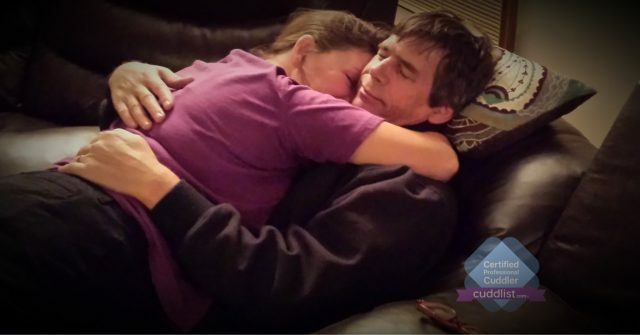 Cuddle sessions provide a safe container to explore and enjoy touch, while being accepted unconditionally for who they are, and where they are in their personal life journey. There is not a bullet point for “awesome cuddling and snuggling” as that may or may not happen in any given session. There is no prescribed or pre-determined flow of what may happen in a session. Cuddling can be wonderful for those in a place to participate in close proximity touch, but not everyone is ready to jump into a full-on spoon. Sessions evolve based on the desired outcome of the session from the client perspective and what they are seeking. The Cuddlist practitioners intention for the session is to be present and curious, while modeling communication and boundaries, encouraging you to ask for what you want. When the session begins, we will have a short conversation about the code of conduct, objective and subjective personal boundaries, and agree to speak up or change what is happening if we are uncomfortable. From there, you will be asked how you would like to proceed. That may take the form of continuing to have a light or deeper conversation, practicing consensual touch to build confidence and trust, sitting quietly with each other, taking a walk, or even just lying next to each other closely or far apart. You are in charge. We will be present and engaged regardless of where you are in any particular moment. What feels good now, may not feel good in 10 minutes from now. You are encouraged to change your mind, ask for what you think might feel good, and be yourself. Those of you who may be interested in learning more are welcome to contact me directly. But I also encourage you to spend a few minutes with your search engine of choice to do a search on “Cuddlist” and learn more about our community of trained professionals.